This is truly a black eye for American foreign policy. The United States has certainly racked up its fair share of embarrassing, hair-brained attempts to take down Fidel Castro over the past 60 years, but what happened this morning may have been our government’s most cringe-worthy attempt yet: The CIA just completely bungled an attempt to drop a piano on Castro’s funeral procession. Wow. The CIA just proved that it cannot let its obsession with Castro go, and that as far as total incompetence goes, it’s at the top of the list. 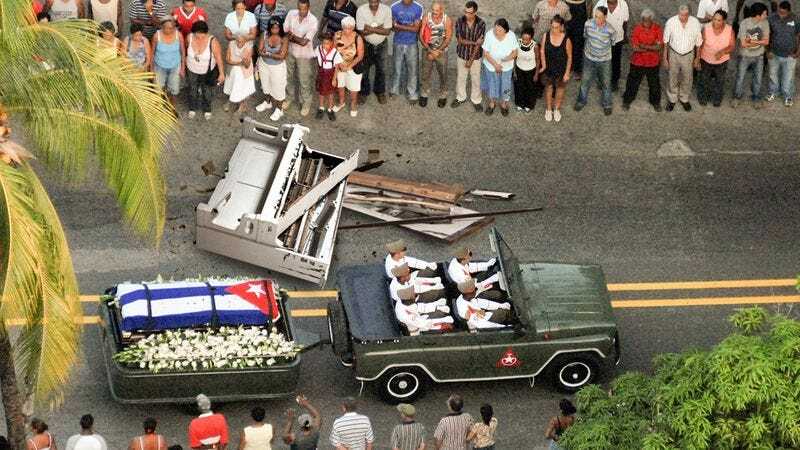 According to intelligence sources, the CIA started to plan the dropping of a 400-pound Steinway on Castro’s remains the moment the agency was made aware of the Cuban leader’s passing. Agents devised a system where they would tie a piano to a helicopter and fly it above the funeral processional, but in a mortifying turn of events, the rope was reportedly cut too early, and the piano fell out of the sky and landed harmlessly 50 yards ahead of the march. After a 200-foot drop out of the sky, the piano smashed against the pavement with a deafening combination of high and low musical notes, exposing the idiocy of both CIA agents and the United States for the world to see. At that point, eyewitnesses reported that Castro’s funeral parade paused momentarily, looked up to the sky in confusion, and then proceeded to walk right around the rubble, as if nothing had happened. Yikes. The CIA was clearly trying to end with one successful mission after 630 failed attempts on Castro’s life, but just like always, they totally face-planted. How is America supposed to project democracy and non-interventionist policies to the world when we just got caught red-handed trying to smash a head of state’s corpse with an air-dropped piano? The hypocrisy is sickening. Unfortunately, it looks like what intelligence officials were apparently calling “Operation Beethoven” is just one more dark spot on American-Cuban relations. Hopefully, our government can stay out of Cuba and dig ourselves out of this one, but knowing them, we’ll probably see more bungled attempts in the future.